How to maintain naturally curly hair. A photo of my mom and me. Alas, I did not inherit those huge curls and fine strands. I’ve gotten so many comments and emails regarding how to care for naturally curly hair. I guess most of the people who’ve requested for a blog entry that concentrates on natural curl care came from either my post about Park Jun Salon or Studio 546 Salon. Anyway, hope you haven’t gotten tired of waiting for the write-up, so here goes. As I have mentioned months before, I will never go back to rebonding (chemical straightening) to tame my rebellious mane. What you see in my photos are not low-maintenance. Naturally curly hair is far from being low maintenance, which is why I cannot blame some women for wanting to end their misery by just visiting the salon and having their hair chemically straightened twice a year. Nevertheless, I think having to live with a set of specialized hair care products and leaving your locks alone (translation: NO COMBING!!!) is so much better than having to iron your roots everyday when the real curls start showing. You also don’t have to deal with badly damaged strands on the 8th year of your chemical straightening habit. This happened to me. Imagine how dry my hair became after 8 years of rebonding, which I do twice a year. Anyway, here are the steps. First: pick your favorite shampoo time. Only do it once a day or every other day. I usually shampoo in the morning because I don’t like the smell of my scalp when it perspires. This country is very humid and I am prone to dandruff, which gets worse when I’m very stressed. Of all the organic shampoos I’ve tried, this is the best. For me, at least. It doesn’t have sulfates, parabens and all those other icky things I don’t like seeing in the ingredients list. I will never ever ever endorse any shampoo that is not organic. I am not an organic products nazi, but my scalp is one area that is non-negotiable. The reason for this is that many shampoos — other organic and natural products included — have detergents in them. Those bubbles and foaming agents that Filipinos soooooo love? They’re called surfactants. Usually the ones with the word “sulfate” or “sulphate” in them are the synthetic surfactants. These strip your scalp of its natural oils, which causes your scalp to then work overtime…by doubling the oil! That’s why I know if a product that claims to be organic isn’t really totally organic. My scalp itches to high heavens and I flake like there’s no tomorrow. HumanHeartNature is one of the few organic shampoos that worked for me and worked with my budget. The 500mL bottle (which is A LOT of shampoo) costs about P250, while the smallest at 50mL costs about P37. Another recommendation, if you can shell out P450 a pop, would be A’Kin. A’Kin is an Australian organic body care brand that’s available at Rustan’s. With both HumanHeartNature and A’Kin, I always buy the citrus variant. Ok, this is where I ease up on the organic stuff. I haven’t found an organic conditioner that’s powerful enough to keep my riotous curls from waging war on each other. So far, only L’Oréal Nutri-Gloss conditioner works pretty well with my super dry hair. Although I try to keep the conditioner away from my scalp, I know that I still get affected somewhat. That’s why I need to shampoo everyday. There’s the trade off. Here’s the thing with conditioner that I’ve learned. The more you put, the more relaxed your hair gets. So if I want bigger curls, I put more. If I want tighter curls, I put less and then leave the styling to the next product. Oh, and I only comb once a day. I do this during the conditioning stage. I use a wide-toothed comb to distribute the conditioner as evenly as possible. I no longer run anything through my hair after rinsing. After bathing, I do all my other stuff like moisturize my face and put on some clothes. The routines leave enough room for my hair to dry a little bit. Just a little bit. I need it damp — not dry — for the third step: styling. Oh, this thing is faaaar from being cheap. I bought it from Park Jun Salon the first time I visited because that’s what the stylists recommended. Yowch, my wallet! But Oléo-Relax works in miraculous ways. It can tame my curls without making them limp. See, everything on its labels are written in French but if my understanding of the word “disciplinant” is correct, then it actually disciplines very dry and rebellious hair. The front label also claims that it gives a “soothing, controlling care”. So basically, it’s anti-frizz. And we all know how many curly-haired women have moaned about frizzy hair. Hm. Of the two products, the Hair Repair (right) is the most effective. It’s colorless and has a texture that’s similar to Oléo-Relax (Vitress is just a wee bit thicker). Even though this local product is not nearly as super effective as its more expensive French counterpart, it works pretty well for something that costs only about P30-P50. It also comes in a very very small tube, the size of a lipstick, for those who love traveling. The Hair Polish (left), on the other hand, I sometimes use with the Hair Repair. It’s not as effective in relaxing my mane but it’s the most available of all the Vitress variants. I get frustrated at times because it’s the only variant I find in Watson’s these days. The 100mL bottle costs around P46. As with Oléo-Relax, you need to use Vitress while your hair is damp. There was one time that I ran out of Vitress and my hair started to get poofy. I nearly declared the incident an emergency because I “flew” to the nearest Watson’s and bought a bottle of the Hair Polish. Since my hair had dried out, I had to wet it all over again so that I could style it with this. 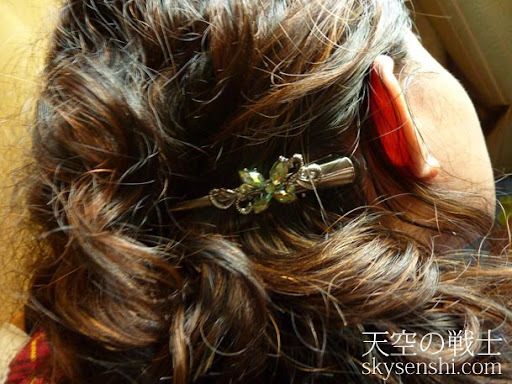 There are many ways of styling curly hair. One technique is for you to twirl your hair with your fingers, which kind of makes me look like a pa-cute idiot sometimes. Especially when it became a mannerism. (Many of us grew up with images of the stereotypical bimbo twirling her ringlets in her fingers. I shudder at the thought.) This could make your curls bigger, though. Just twirl and squeeze, twirl and squeeze. Repeat until you’re satisfied. Another way is to scrunch up your hair while it’s damp and while applying the styling oil/cream. Scrunch, scrunch, scrunch till you’re happy with the results. This could make your curls tighter. When the curls start getting chaotic and I don’t have any Vitress with me, I use jeweled clips (bought from Quiapo) to keep them in place. While I feel like I’m so unkempt and the glittery clips do little to help get my hair out of my face, my colleagues sort of disagree. They find the resulting disheveled look effortlessly cute, like I’m some sort of a fairy princess. Goodness knows why. Anyhoo, I hope this write-up has answered those many questions about naturally curly hair. If there are other questions just post your comments and I’ll attempt to answer them to the best of my abilities. Hahaha, Andy kaloka! Hahahaha! That's because you don't have hair? LOL! I'm obsessive-compulsive. When I see my Buzz counter go up. I JUST have to click on it and see what's going on. OMG, I can relate!! I also always check my Buzz. Although I've actually added your blogs to my Google Reader as well. There was a time when I used mousse but you're right. It will fry your hair even if you use the alcohol-free ones. I go to classes in UP and I do long walks to and from the MRT station, which means I always will get exposed to the sun. And yeah, I nearly pulled a blonde joke here, too. Hahaha! Ahhh! I need naman the repair. Sometimes nga I want to put on a cap or something, for when I'm going to be out in the sun. Ahhhh! Super useful stuff! OMG, it's like there's a whole website devoted to anti-frizz! Thanks thanks! I'm going to look for those headbands that have built-in bangs hahaha! So I don't have to use a hair dryer when I want bangs. And when I don't want bangs, I can just pull them off. Naisip ko ngang magpakalbo nalang tpos bili ako ng wig.lol! Siguro kasi mild shampoo sha? Ganun yung ginagawa ng iba eh, baby shampoo ginagamit. hi there! if you're familiar with shopwise supermarket they sell frizz ease and they do work! i think they have it in pcx as well. Thanks so much! That was very helpful! Body lotion? Seriously??? Forever ko problem ang frizz kaya minsan yung outer layers ng hair ko feeling ko kelangan i-digital perm para mapilitan wag mag-frizz. Ang weird lang kasi kulot talaga ako tapos magpapakulot para lang mawala ang frizz. Haha! Thanks for this post, very helpful! The kerastase part is waaayyy too much for someone like me. I recently bought finesse mousse, haven't tried though, hope it works. I just really want to tame my super poofy hair. Wow, that's pretty helpful info! Thanks! I will try that next time. I use minimal oil lang (Human Nature Beauty Oil), but if the weather is really hot, it becomes unbearable. Thanks for posting this. I also have curly hair but I have a hard time maintaining it. You're welcome! 🙂 Always glad to help curly, problematic hair.